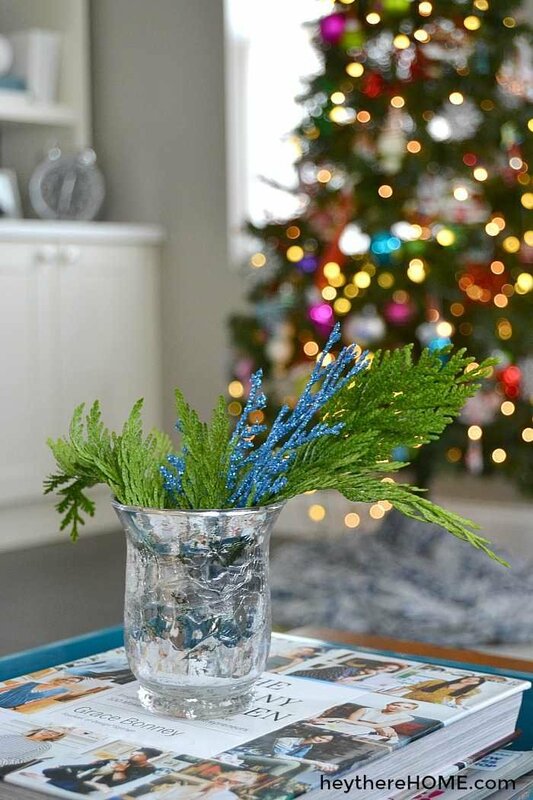 It’s time for one of my favorite posts of the year — Christmas home tour time! 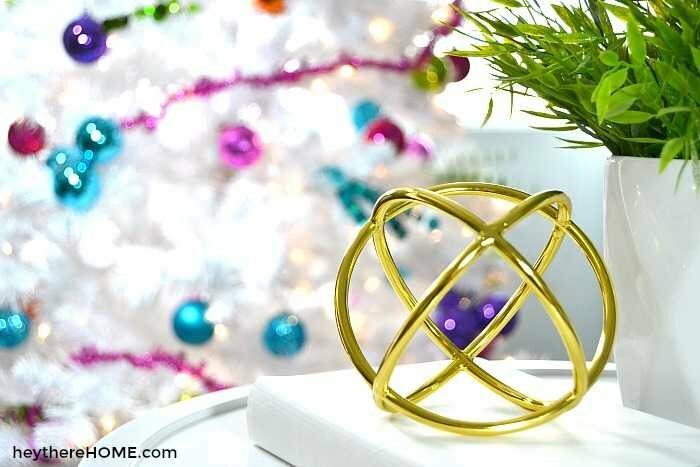 True that it’s one of my faves because I love Christmas time and Christmas home tours, but I also love to see how other’s decorate for Christmas and after I show you around my house, I want to invite you to click through the links at the bottom of this post to see how my friends are getting in the Christmas spirit! Grab your beverage of choice and click around awhile! Every year, I try and use the decorations I have in a different way. Some years I add a few new decorations, sometimes bought, sometimes made, but the goal is always to not spend a lot of money and still have a fresh look, a little different from the year before. In years past, I decorated my front room in lots of blues and whites. 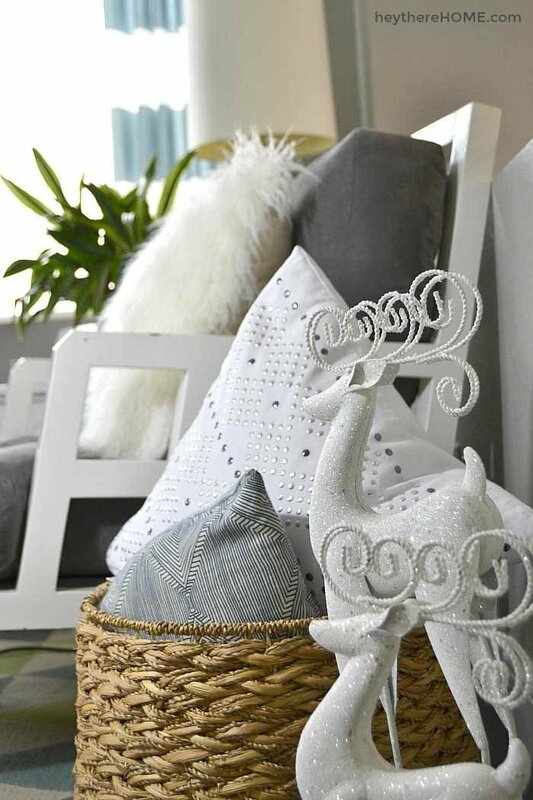 Sort of a winter wonderland type theme because of the decor already in that room. But this year I decided to go with fun poppy Christmas colors and I’ll admit, it might be my favorite yet! The new addition is my white tree! I wanted to keep the ornaments super simple so I stuck with ornaments in bright colors and just a little bit of garland. I love the way the bright white tree and bright colored ornaments pop with the little hints of gold and glass that I have around the room. I recently put my spring throw pillows away when I was getting my family room ready for fall, but pulled them back out to add some color to the sofa. Love it when I can just use what I already have! I took most of what was on these shelves down and used them as the focal point. 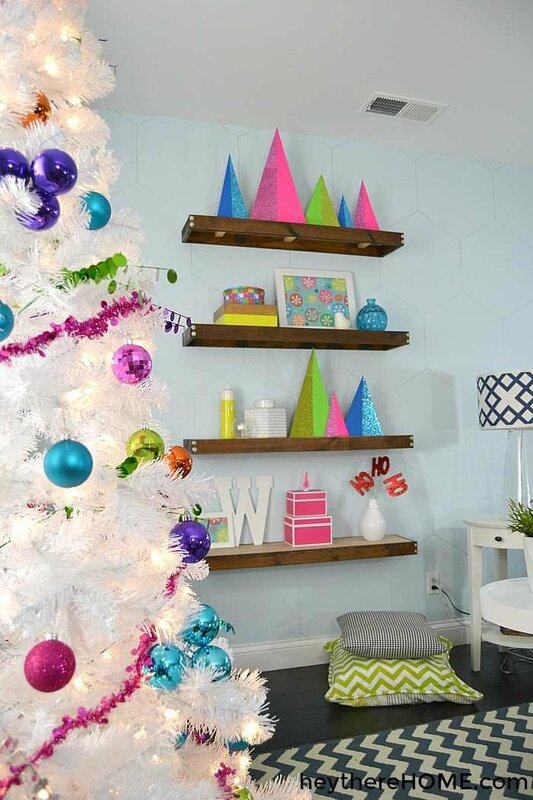 The modern trees that I made last year were perfect for these shelves and just a few more accessories in the same bright color palette were all they needed! 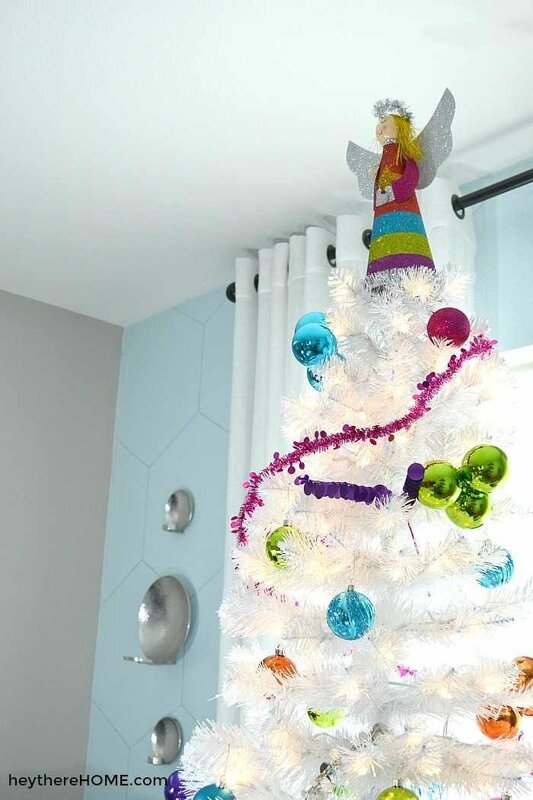 And of course no tree would be complete without a tree topper and our rainbow glittery angel was just perfect for this tree. 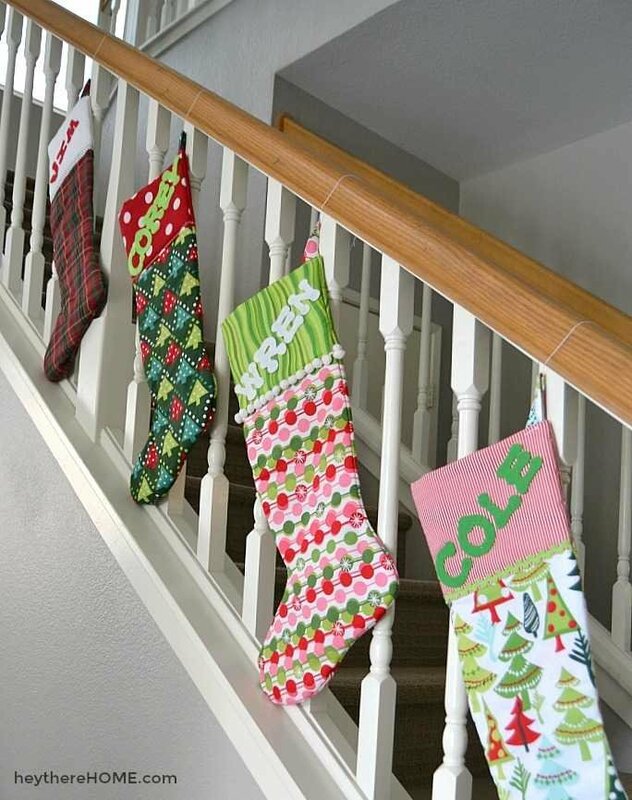 As you leave the front room and head into the back of the house, where we spend most of our time, you pass the stairs which this year is the perfect spot for our stockings. Especially since we don’t have a fireplace. The family room has a completely different vibe than the front room. Instead of super modern and bright, I kept it really simple and went with blues and whites and a lot of greenery. 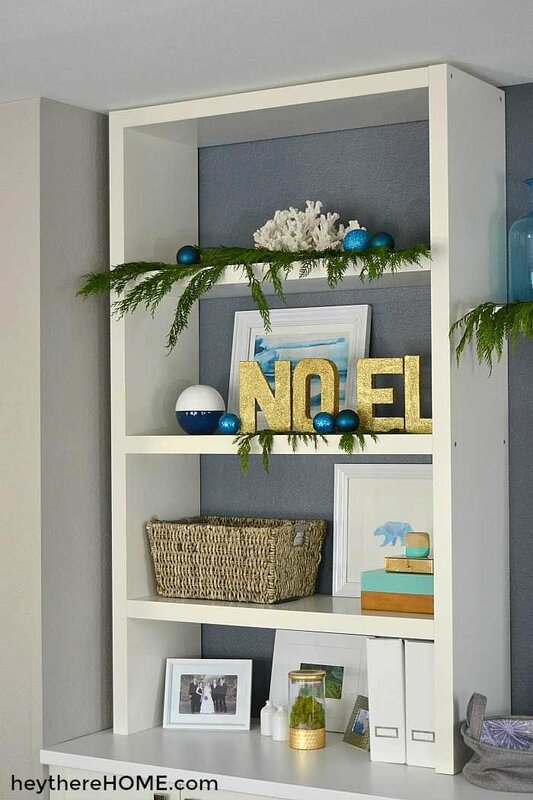 Over the years I’v found that picking just a few shelves to do very Christmasy makes a bigger impact than spreading the Christmas decorations out. 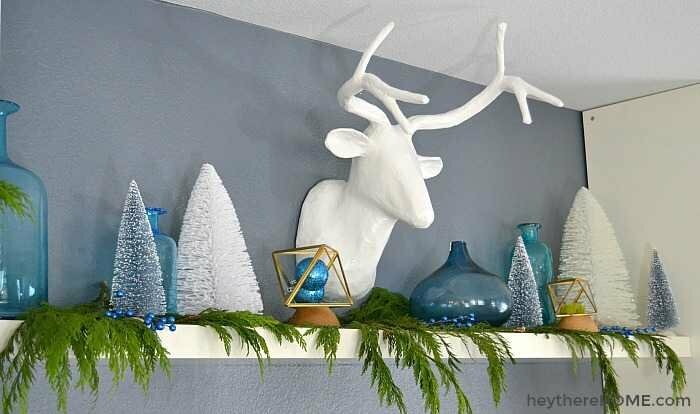 So I put all of my bottle brush trees with our Reindeer and some fresh garland and sprinkled in my blue glass bottles for color and to fill in the spaces. On the side shelves I kept the Christmas decorations on the top two shelves by adding some greenery and ball ornaments. And this was the perfect place for the gold glitter letters I made a few years ago. 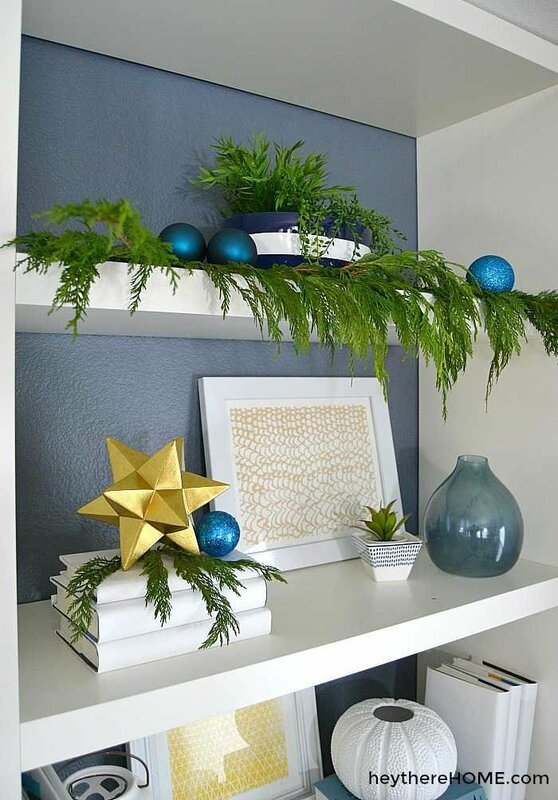 On the opposite side I kept the same pattern of greenery and ball ornaments on the top shelf, with a gold accent on the shelf below. 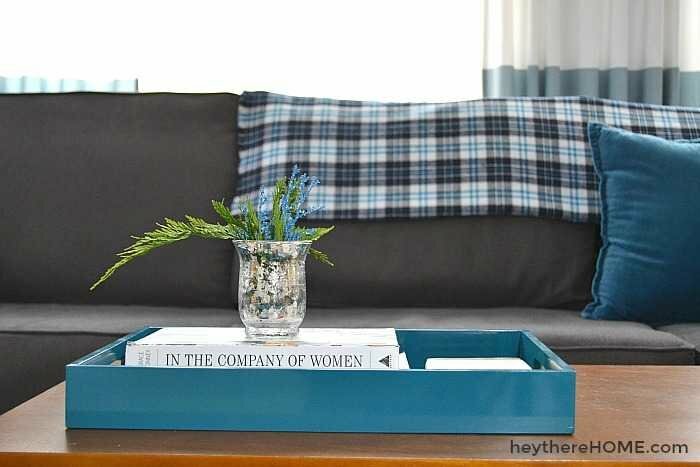 I also brought the tablecloth from my Fall table in and folded over the back of the sofa to add some color and pattern. The tree in this room is our family tree. And around here that means all of the ornaments we’ve collected over the years go on it and in whatever way the kids want to put them on. Which usually means there are a ton of ornaments at the bottom all clumped together, but I don’t fix it cause it’s their creation. 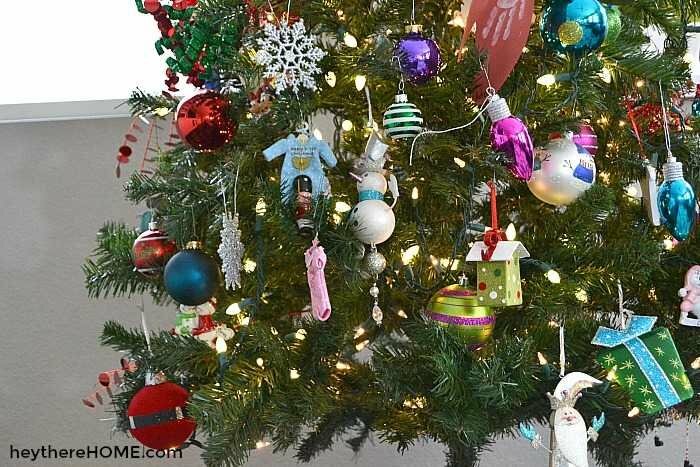 We always have a really fun evening decorating the tree and the kids have their favorite ornaments that they can’t wait to put on. 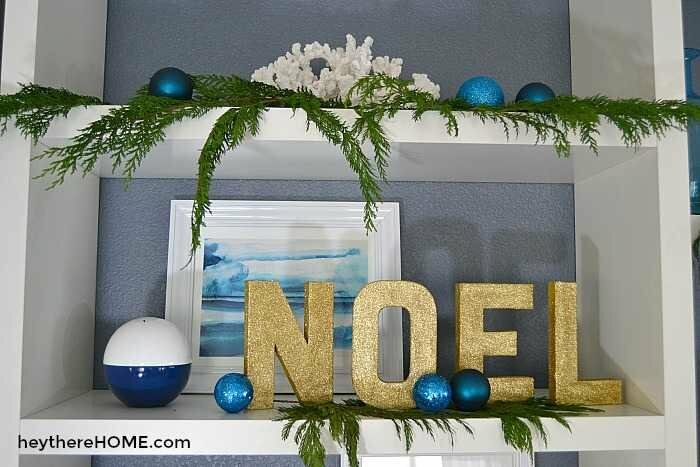 Decorating for Christmas is a really fun tradition and I love the way it instantly brings on the season. I’m so excited that you stopped by today, and there are many more homes to tour now! 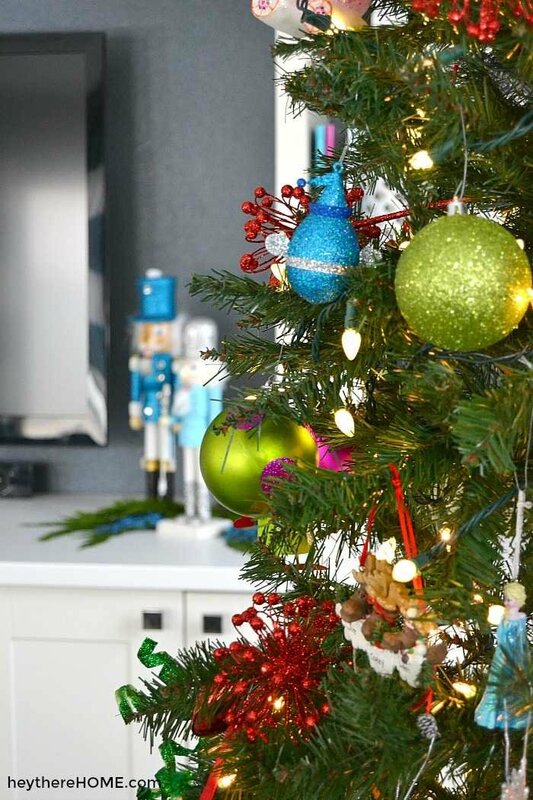 Just click any of the links below to be taken to the next Christmas home tour. Love the non-traditional colors in the front room and then all that beautiful greenery in the family room: best of both worlds! 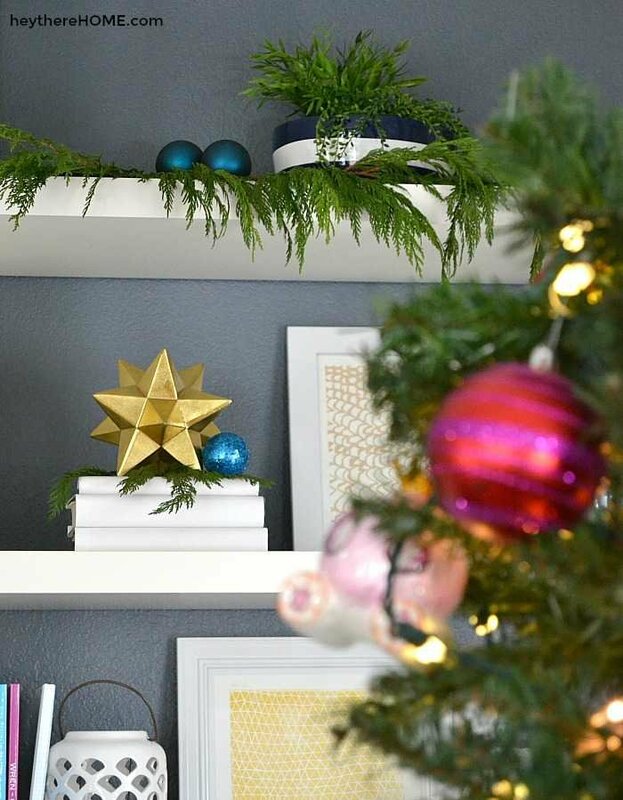 What a colorful Christmas tour and I love all the greenery and how you styled the bookcases around your TV! 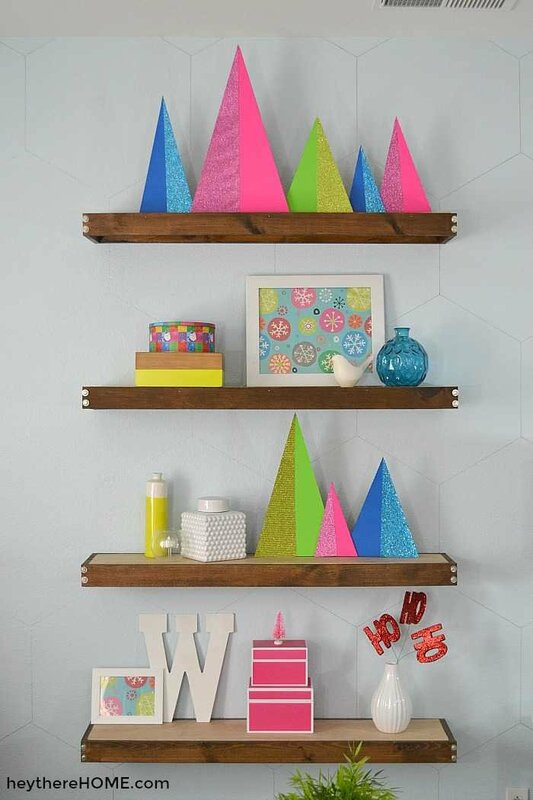 Such a fun bookcase to decorate for!! Love and I also adore the idea of hanging the stockings on the railings! 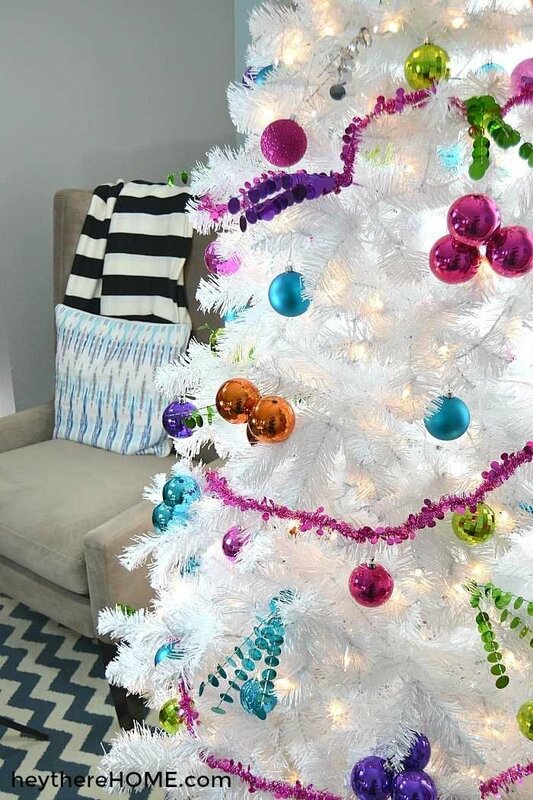 Love your white tree and bright decor! I just love the bright colors! Those sparkly trees are my very favorite. Really nice decorations! Love these colors! So bright and cheery! Perfect for the holiday season! I love it! Have a very Merry Christmas! 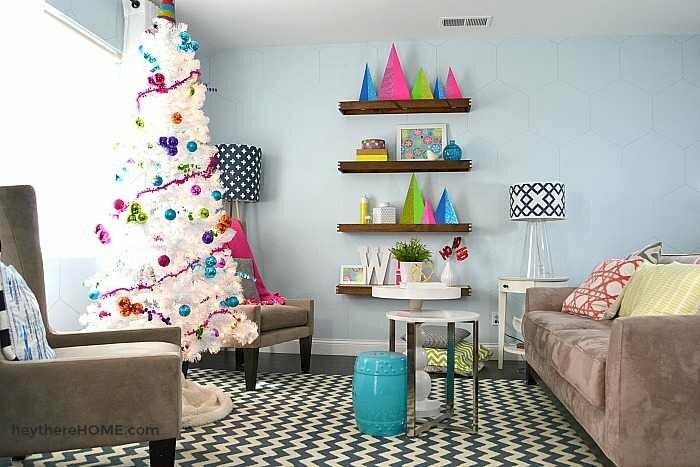 Just love your house tour, the colors, decoration, etc. Where did you get the pink boxes? I have been looking everywhere! Your bookshelf decor is stunning, and I can only agree with Erica the bold colors pop right out. 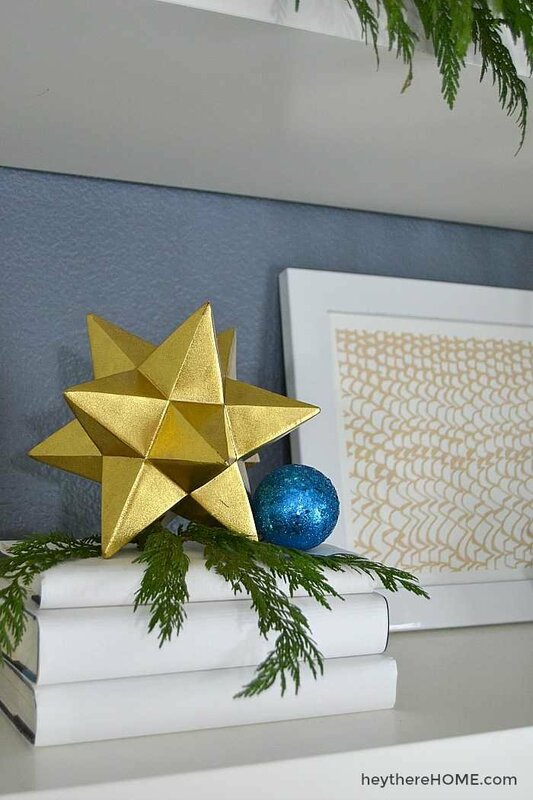 Your home tour is gorgeous, thank you for sharing and Merry Christmas! 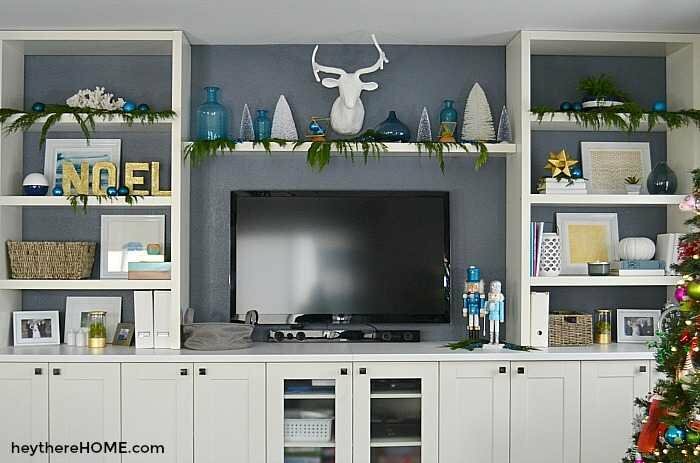 I am a sucker for all of the blues in your family room, but I also love how all the vibrant ornaments pop against the white tree. Such a great tour!